Made in Japan and crafted from ceramic, this Japanese rice bowl with lid features an adorable and well-loved animal—the owl. In Japan, owls are seen as lucky symbols because the pronunciation of owl is a synonym for good luck. As a result, gifts bearing the motif of owls are often gifted to friends and family to wish them good fortune. This adorable Japanese rice bowl with lid features a lovely ultramarine blue and the design of five owls perching on branches or in flight against a night sky. 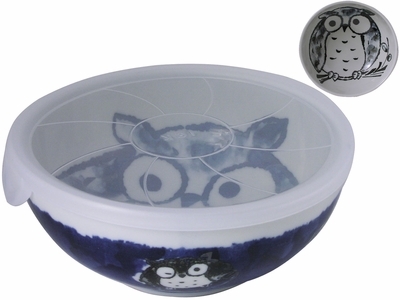 The interior of this Japanese rice bowl with lid features a large black and white owl sitting on a branch charmingly depicted with an adorable innocent air. Complete with a fitted plastic lid, this rice bowl is perfect for serving and enjoying your favorite rice, soup, salad and dessert dishes, it is also ideal for storing and carrying your leftovers or lunches to and from work and school. Versatile and convenient, it is the perfect solution for packing lunches to the office or to school.